Dr. Alison Ganong is a Physical Medicine and Rehabilitation (PM&R) Physician specializing in interventional sports medicine and spine care. She obtained her medical degree at the University of Nevada, School of Medicine in Reno and completed a 4-year residency training program in PM&R, at the University of California Davis Medical Center. She then completed a sports medicine, interventional spine, and musculoskeletal ultrasound fellowship in Napa Valley, under the direction of Dr. Marko Bodor. She is board certified in Physical Medicine and Rehabilitation and Sports Medicine and is a member of the International Spinal Intervention Society, American Academy of Physical Medicine and Rehabilitation, American College of Sports Medicine and American Medical Society of Sports Medicine. 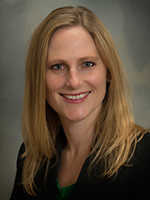 She has lectured at multiple conferences on topics of sports medicine and spine and has provided teaching in musculoskeletal ultrasound to sports medicine fellows and physicians. She travels as a physician with the US Ski team and has worked as the co-medical director of Ironman Lake Tahoe. Dr. Ganong grew up in the North Lake Tahoe region and returned to the area to practice. She strives to help maximize peoples’ function, performance and quality of life, with a goal of returning them to what they love. She treats sports or occupational related orthopedic and spine injuries. She emphasizes obtaining an accurate diagnosis so that she can formulate an appropriate and effective treatment plan and a partnership with the patient and her other providers. She is skilled in the use of many tools to advance the diagnosis and treatment plan including; musculoskeletal ultrasound, fluoroscopy and electrodiagnostics. She uses these modalities to provide treatments such as accurate joint and tendon injections, platelet rich plasma (PRP) and stem cell therapy treatments, spinal transforaminal and interlaminar epidural injections, spinal facet joint injections or radiofrequency ablations and nerve blocks. Downhill ski racing was a passion of hers while raised in Alpine Meadows and she has continued to embrace the Tahoe lifestyle as an avid downhill and nordic skier, triathlete, and outdoor enthusiast. She also enjoys international travel alongside her husband/physician, Dr. Paul Krause who also practices in the community.